Sinclair Broadcasting, the nation’s largest owner of TV stations, has been attacked in the press for allegedly helping President-elect Donald Trump win the election. Sinclair maintains this is not the case and internal emails back the company’s argument. Politico reported in December that Trump’s son-in-law and adviser Jared Kushner told business executives that the Trump campaign struck a deal with Sinclair Broadcast Group to get better media coverage. Sinclair is a Maryland-based company that owns 173 stations in 81 cities. Sinclair has adamantly denied the charges that they struck a deal with the Trump campaign for more favorable coverage. 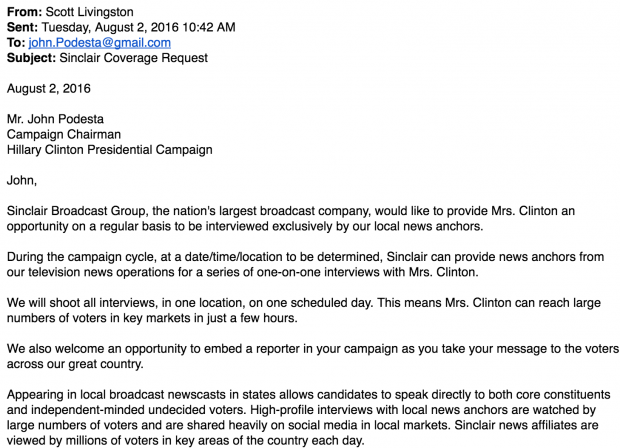 “Sinclair went above and beyond with interview offers to both campaigns. This was a fully-transparent project called ‘Beyond the Podium’ where candidates could speak directly and at length to viewers on key topics. 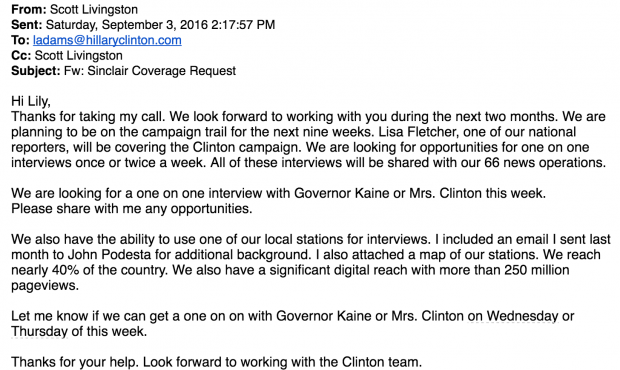 The simple fact is that one candidate took advantage of this offer and the other did not,” Sinclair’s vice president of news Scott Livingston said in a letter to Washington Post editors. The Sinclair executive told The Daily Caller that when Kushner implied the Trump campaign made a deal with Sinclair, he was referring to the offer the company offered to air interviews in their entirety across the country, and that there is nothing nefarious about this. Besides their television stations, Sinclair also owns Circa, a millennial-oriented online news site that was launched in 2016. 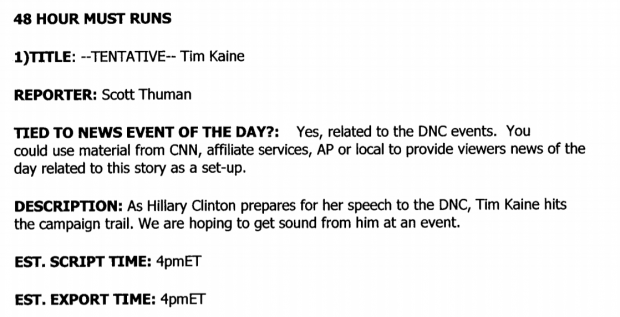 An email provided by Sinclair to TheDC shows a proposal to Clinton campaign chairman John Podesta to interview Hillary Clinton to coincide with the launch of Circa. 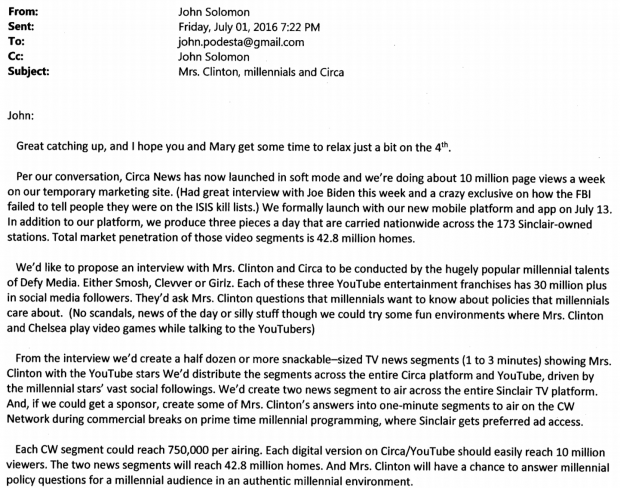 John Solomon, chief creative officer of Circa, told Podesta the interview would have no “scandals or news of the day” just questions about “policies that millennials care about.” Solomon also offered to have this email be cut up into TV news segments that he estimated could reach 43 million homes. The Washington Post story also focused on “must-run” stories distributed to Sinclair stations by the Washington office. “News stories and features favorable to Trump or that challenged Clinton were distributed to Sinclair stations on a ‘must-run’ basis — that is, the stations were required by managers in Washington to make room in their evening newscasts or morning programs for them,” Washington Post reporter Paul Farhi wrote. Sinclair has provided emails to TheDC, that they also shared with Farhi, which show that interviews of Democratic vice presidential candidate Tim Kaine and Vice President Joe Biden were also on a “must-run” basis.